There are seven hotels in the NAGC19 block that offer unique neighborhood experiences and are conveniently located with free shuttle bus service. The room block can fill quickly. Make your reservations soon. A bustling nightlife along Central Avenue (former Route 66), downtown is home to many restaurants, nightclubs, and theaters. This lively neighborhood is centered around the University of New Mexico, near the old Route 66. Historic old town is the heart of Albuquerque. 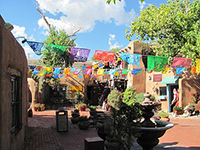 Its narrow streets and century-old adobe houses are home to New Mexican eateries and tiny artisan shops. Make your reservations today. The room block can fill quickly.